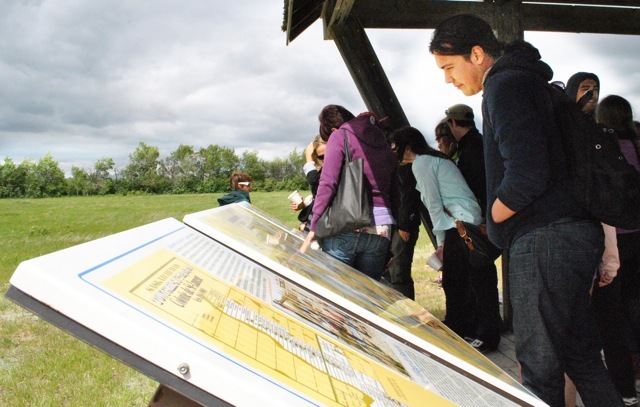 2013 PLSNP students learn about the traditional Metis land holding system at Batoche National Historic Site. One important aspect of improving access to justice is making sure that people from all backgrounds can be part of, and help shape, our justice sector. The Law Foundation of Ontario has identified a need for greater inclusion of Aboriginal peoples specifically. With this goal in mind, the Foundation has funded a unique Program of Legal Studies for Native People (PLSNP), run by The Native Law Centre at the University of Saskatchewan. The program offers legal education, skills instruction and financial support to Aboriginal students, from across the country, who have been admitted to law school. The best way to understand what the program does for Aboriginal law students, their families and their communities is to hear directly from one of the students. Alyssa Flaherty-Spence received the Access to Justice Skills Development Award through a Foundation grant to PLSNP. The program gives out four awards of $3,000 to the most improved students in the program. There are no words to say how thankful I am for receiving this award and financial assistance. It is truly a gift to begin a new journey such as law school, and receive support from people who I haven’t even met but believe that I can do it! As an Aboriginal-Inuk/Cree student, going into my first year of law school is frightening enough. Having extra financial support just relieves so much stress for me. I am very grateful for the help you guys have given me! As well as is my family. Not only are you helping an Aboriginal law student, but you are improving the legal world for Aboriginal Law in Canada and Aboriginal Communities. Without supporters like you, it would be another hurdle for Aboriginal people (and we already know there are too many!) It is people like you that are truly enhancing Canada’s justice system as well as Canada as a whole. . . . The education system is in much need of more Aboriginal students and educators. Your support is valued! LFO is proud to support the Program of Legal Studies for Native People with a grant from the national Access to Justice Fund. This program is one step towards ensuring the future leaders of our justice sector are drawn from and represent the many diverse communities that make Canada unique. The Law Foundation of Ontario (LFO) launched the Access to Justice Fund in May 2010. As of February 2013, LFO has awarded 109 grants, for a total of $14.1 million, from the fund. Grants are made for projects focused on linguistic and rural access to justice, Aboriginal issues, self-help, family violence, and consumer rights. It is a permanent fund that channels cy-près awards into innovative projects for greater access to justice. Grants have been made for provincial, multi-province, and cross-country projects. The fund is open to receive new cy-près awards. At the current time, the fund is closed to new applications.